The Broncos will play their first game of the 2012 season this Sunday (19-02-2012). The Nijmegen Pirates will host the game, and the Broncos are the ones to face them in this seasons’ kick-off! The game will start at 14:00, at Sportpark Vossendijk, Winkelsteegseweg 208, 6534 AR Nijmegen. The juniors will play in cooperation with the Pirates against the Rotterdam Trojans, the kick-off is at 11:00. 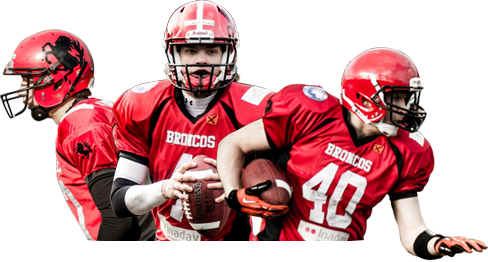 If you want to support the Broncos you are welcome to come with us to Nijmegen, please contact us for more information. For the players: We get together at 08:30 in the morning at Vogido, bring both of your jerseys (if you have any). LET’S PLAY SOME FOOTBALL! !